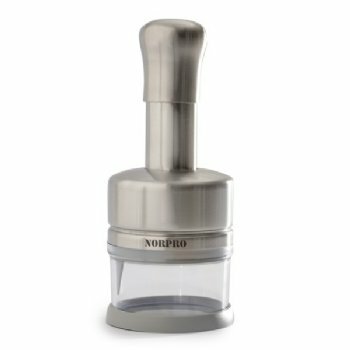 Chop vegetables, fruits, nuts and herbs fast and easy! This easy to use food chopper will make short work of chopping chores. Blades rotate 60 degrees after each time the knob is depressed, evenly chopping items. Two rotating blades keep food off of the sides while chopping. Includes a lid for the storage cup, so unused portion is covered while stored. Stainless steel body and blades.